Advanced fuel assemblies featuring chromia-doped fuel pellets and chromium-coated fuel cladding are to be loaded into a US nuclear power reactor. The fuel, developed by Areva NP under the US Department of Energy's (DOE) Enhanced Accident Tolerant Fuel (EATF) program, will be loaded into the Vogtle 2 plant in Georgia. Areva NP yesterday said four lead test assemblies featuring chromia additions to the fuel pellets and a chromium coating to the fuel rod cladding will be loaded into Vogtle unit 2 in spring 2019. The company will begin manufacturing the chromia-doped fuel pellets at its facility in Richland, Washington, later this year. 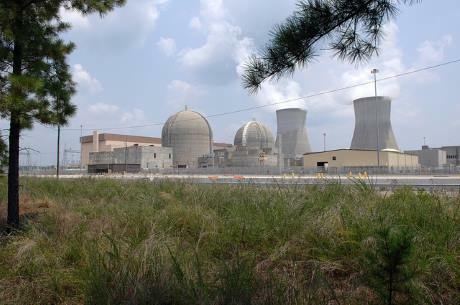 John Williams, nuclear fuel director for Southern Nuclear Operating Company, which operates Vogtle on behalf of Georgia Power and the plant's other co-owners, said advanced technology fuel assemblies would make plants "even safer" and result in more flexible operations. "This game-changing technology is not a small step, but a leap for our industry," he said. The fuel technology aims to offer reactor operators more time to respond in emergency situations. Chromia-doped fuel pellets have a higher density and help to reduce fission gas release should a reactor lose cooling. The addition of a chromium coating to the fuel's existing zirconium alloy cladding offers advantages including improved resistance to oxidation at high temperatures, the reduction of hydrogen generation, and resistance to wear. Earlier this year Areva advanced to the second phase of the DOE's EATF program after four years of initial research to identify promising new technologies. The DOE awarded the company a $10 million, two-year grant, plus the continued use and support of the DOE's national laboratory facilities, to design and develop the advanced nuclear fuel concept. Robert Freeman, vice president of Areva NP's Commercial and Customer Centre for North America said the company's approach of incorporating advanced fuel characteristics into its proven GAIA fuel design, enables the fuel to be deployed into reactors more quickly. The development of the chromia-doped fuel is the near-term solution of Areva's EATF program. The next step will be the development of fuel using silicon carbide cladding with chromia-doped fuel pellets. The company is supported by partners including US national laboratories, universities and utilities, and is deploying and further improving its technology as part of the DOE's Fuel Cycle Technologies program.